Join us for an enriching and entertaining weekend of Spanish in New York City. This weekend is designed for people who have some background with Spanish. Some students are quite comfortable communicating in Spanish while others can understand a lot but struggle with speaking. Although the class is taught almost entirely in Spanish, we make it all comprehensible so that everyone can benefit. The weekend offers a lively stress-free and entertaining experience. This is a refreshing approach to a language class. No worksheets, verb drills, vocabulary memorization. No practicing dialogs. 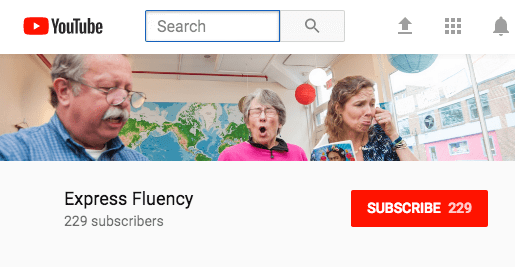 Just a ton of comprehensible and highly engaging Spanish in conversations, stories, videos, and music. You will leave thinking in Spanish and with improved confidence. Break provided for lunch both days. Either BYO or go out. We are offering a special $50 referral discount for our NYC classes. Bring a friend new to Express Fluency and you will each get a $50 discount. Enter code “NYCReferral” at check out. If your friend has not yet registered, we’ll send you a $50 refund once s/he signs up for a class. Watch out short introductory video to get a better sense of how we teach. Are you a world language teacher? We highly recommend participating in a weekend class as either a student (if you don’t speak Spanish) or as an observer (if you speak Spanish). You will observe countless techniques and strategies in comprehension-based teaching methods which you can immediately apply to your classroom. The instructor will also meet with you after class each day to answer questions. The four weekend sessions I have attended since November 2014 quickly refreshed the Spanish I learned in high school more than 20 years ago. My multilingual husband and Spanish speaking in-laws have commented on my improvement in understanding and conversing with them, which was my motivation for taking these classes. Not only have I learned more Spanish, but I have had fun doing so because of the method used. I look forward to signing up for the next session! I have attended several weekend intensives with my husband and we can’t wait to sign up for the next round of classes. This is definitely the most enjoyable way to study a new language. We have so much fun in class that it doesn’t feel like “learning” and yet at the end of the weekend I can tell that we have acquired a lot of Spanish! Elissa is so good at bringing all her students out of their shells and creating a great classroom environment. where we can all be silly together. I highly recommend the immersion classes! This class is extremely fun and extremely productive! I am shocked how much Spanish I have learned without the drudgery of rote memorization or boring exercises. This is the way language is meant is meant to be acquired! I have attended several weekend intensives and intend to sign up every time they come around. In one word my experience in this class was PERFECT! I was very apprehensive before the weekend started but from the minute I entered Elissa’s class, all my fears were instantly dispelled! She was warm, inviting, encouraging, patient and most importantly a whole lot of fun! The language was taught using methods targeted at higher retention as opposed to just theoretical knowledge. Things one might think ‘silly’ at first started making sense as the hours went by, as we started hearing ourselves becoming more and more comfortable and conversant…even as I stumbled along! I didn’t know more than maybe 5 words before last Saturday morning.. but I can confidently say I knew perhaps a hundred or more by the end of Monday! I cannot wait to go back for the next immersive weekend in October. Met a group of lovely, friendly and equally encouraging people over the 3 days and I hope to stay in touch with them and keep my Spanish going. I atteneded Saturday and Sunday of a weekend course. The course was very entertaining, as well as helpful. I have a decent amount of Spanish vocabulary, however I always freeze when it comes time to use it. The course helped me become a little more comfortable with speaking Spanish, even though what I was saying may not have always been grammatically correct. I attended Saturday and Sunday of a weekend course. The course was very entertaining as well as helpful. I have a decent amount of Spanish vocabulary, however, I always freeze when it comes time to use it. This course has helped me become a little more comfortable with speaking Spanish even though things I say may not always be perfectly grammatically correct. The other students are also very friendly, non judgemental and supportive which helps create a non- threatening and productive learning environment. The best thing that I can say about the Express Fluency course is that afterwards you will notice that you are no longer translating basic Spanish conversations before understanding them. You have instant understanding of basic conversations without translating them into English. It’s like some sort of switch has been turned on in your brain. I highly recommend the Express fluency courses for anyone who is interested in learning Spanish. The immersion and instructional techniques that they utilize are highly effective. And let’s not forget about the fun, the classes are so engaging and entertaining that the days fly by and before you know it the course is over! What a great experience! Especially having several weekends with many of the same people. By the end of the three days, we are speaking Spanish among ourselves. Each time it gets better. I can’t recommend it enough! The weekend class is a great way to gain confidence in speaking Spanish AND it is a great way to spend a weekend! The people are great fun and Elissa is both systematic and flexible in her methods. Highly recommended! The weekend course I took with was great for reviving my Spanish prior to a vacation in the Canaries. By the time I went there I was able to communicate and understand quite sufficiently which was what I wanted and it made the vacation much more rewarding. A perfect course for what I was looking for; I’d recommend it (and great fun!). I took the Spanish immersion weekend and it has been a lot of fun! Thank you Elissa for making a program that allows all of us access to these beautiful languages so quickly and easily. Elissa’s teaching method is definitely not conventional by any means, but it definitely helped and brought back the Spanish I had knowledge of many years ago. I find myself to be speaking more fluidly and with more confidence!